I was just going through some papers and found an article about Beardmore, Ontario folk artist Ewald Rentz written by Canadian humourist Arthur Black. We enjoyed listening to his radio programme “Basic Black for many years on the C.B.C., and reading his syndicated weekly humour column. I don’t know how I came by this transcript of a 1994 show he did on Ewald Rentz, but the content is sufficiently interesting that I thought to reproduce it here to add to the (hopefully) permanent record of this significant Canadian folk artist. In looking him up I noticed Arthur Black started his column in 1976 in Thunder Bay, so it makes sense that he would become aware of, and write about a folk artist who lived so nearby. Arthur Black died Feb 21, 2018, from pancreatic cancer at the age of 74. Three time winner of the Stephan Leacock Award for Humour, he will be remembered for his humour, and the large contribution he made to the promotion and documentation of Canadian culture. “The artist brings something into the world that didn’t exist before, and he does it without destroying something else. A kind of refutation on the conservation of matter.” – John Updike. You know what’s particularly wonderful about this country of ours? Treasures, treasures everywhere. No matter how humble or unlikely the surroundings. Take Beardmore, Ontario. Towns don’t come much more humble than Beardmore, with it’s population of a few hundred souls nestled in the bosom of northwestern Ontario wilderness about ninety miles due north of lake Superiors arched eyebrow. It’s a small town, boasting a couple of gas stations, a general store, a motel or two. Hard to differentiate from any of several hundred other small Canadian towns. You could drive right down the main street, past the grocery store and the barber shop and be back out on the highway before you knew it. Thousands do, every year. Ah, but they miss the treasure that way. It’s the barber shop on Main Street. That’s where Ewald Rentz lives. Who’s Ewald Rentz? Well, first off, it’s “Ed” to his friends. He was born in North Dakota, drifted around a bit through Manitoba, but made his way eventually to Beardmore, where he fell in ove with the land and stayed. And since all that happened back in 1939, folks take it for granted that Ed’s there for keeps. In his 86 years Ed’s done most of the things a Northerner does. He’s been a miner, lumberjack, prospector, cook, and as the candy-stripped pole outside his place attests, a barber. Oh yes, and one other thing. Artist. Ed’s an artist. World renowned as a matter of fact. There are collectors in England who salivate for his work. Curators from the U.S., Montreal, Toronto, and Vancouver make periodic pilgrimages to the barber shop to see if he’s got anything new they can buy. His work is on display in museums across the country including the National Museum of man in Ottawa. Ed Rentz is a national treasure. And the barber in Beardmore. Ed’s what you call a folk artist. He doesn’t do abstract impressionist canvasses or mobiles a la Henry Moore. Balsam, birch and poplar are his media. His inspiration comes from the bush he’s wandered through for most of his life. Ed can pick up a chunk of knotted forest debris that you and I would reject as firewood, turn it over in his own gnarled hands, take it back to his workshop and with the help of a knife and chisels, and judiciously applied dollops of house paint, transforms it into the most exquisite and unexpected bit of art – a ballerina perhaps. Or a bear cub. Or a Mountie. Or a great spotted fantasy pterodactyl in full flight, with a man on its back hanging on for dear life. Ed’s tiny barber shop on the main street of Beardmore is crammed full of his works of wonder. Elves, moose, mermaids, wolves, Prime Ministers. If you are good, and he’s not too busy, Ed might fetch his step-dance dolls. All meticulously hand carved, out of their special cloth bags, set them on the floor, haul out his mandolin, and make them dance for you. But have a care. Just because he is a world-renowned artist and an unusually fine chap of 86 winters, doesn’t mean that Ed’s not a working man too. My no. If it’s a Saturday, you may have to talk to him between haircuts. Ed still knows how to give a haircut. He still knows how to handle knotty customers too – be they balsam or bushworker. “I told that guy” continues Ed, “I didn’t charge you a buck, I charged you twenty-five cents to cut your hair. By the mid-nineties we were doing a lot of business with Quebec collector, Pierre Laplante. He was, at the time a very successful dentist, and determined collector of Quebec antiquity and contemporary folk art. A very good fellow who we enjoyed meeting up with every few weeks at his country home, where typically after a good meal and a little wine was consumed we would inevitably end up in his converted machine shed, which was stuffed to the walls with wonderful things, so that I might buy some of what he was prepared to let go of. At the time he was keeping five or six pickers busy full time in an attempt to find him the “all” of the best pieces available. They would bring in full truck loads and he would usually buy everything to get the best price, and assure their dedication. He would sell me all the stuff he didn’t want to keep at very reasonable prices, and that kept me coming back. His appetite was voracious and he rarely said no so there was a lot of stuff arriving. For a couple of years before we both slowed down we did a lot of great business together. One particular evening he suggested that after dinner, he was particularly excited to show me some new work by a previously unknown carver that he had recently become aware of. That was the first time I saw the work of Rene Dandurand. It was different than most other work being produced in Quebec at the time, and although I had to admit to Pierre that it wasn’t purely my style (my taste runs a bit more primitive and less Norman Rockwell) I could see that he had real talent and vision, and I liked that his pieces contained humour and emotion. Pierre was good enough to give us his address and phone number in nearby Valleyfield. We called him and he was very welcoming. We made an appointment to see him the following day. He was very open and we had a good talk with him and his wife Julienne before they showed us his workshop where we bought five or six pieces. I made several stops at his place on subsequent trips but as he became popular there was less and less to buy. Rene Dandurand is a highly original Quebecois carver. Born in 1934, he started carving in the late nineties, after early retirement from his employment as a machinist. His first piece was a simple small boot, but this was quickly followed by roosters, birds, and figures. Before long his subjects evolved into more elaborate and complex compositions incorporating figures, foliage and animals to tell a complete story. As Quebec folklorist Lyle Elder points out in his bio of the artist, “Rene Dandurand carves every aspect of the human condition and always with great humour. There is a joyfulness in his vision of people busy at their lives. His carvings are always evocative, charming and full of colour. Rene Dandurand is certainly one of Quebec’s most talented artists”. Rene Dandurand’s carvings are worked in one piece from a solid butternut or pine block. Some early works are left bare, showing the grain, but most are painted by his wife Julienne, an excellent colourist, after lengthy consideration of suitable colours. Although Dandurand’s children supplied him with a full set of carving chisels, he prefers the familiarity of his two or three ordinary old knives. 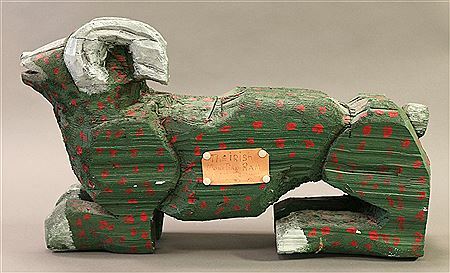 Dandurand’s carvings are represented in major public and private collections of Canadian folk art. I am uncertain if Rene continues to live in Valleyfield, Quebec. It was suggested to me a couple of years ago that he had passed away, but as yet I have been unable to confirm or deny it. If anyone knows, please let me know and I will amend this article. Thanks. In retrospect, “no slouch when it comes to art” sounds a bit flippant, when I was meaning to suggest that “no slouch” is an understatement. I had and have great respect and admiration for her taste and instincts, and her contributions to the world of folk art. She was also very nice to me when I was a stranger in the midst of the dealers at the Outsider Art Fair in 1996. I remember seeing Phyllis Kind standing in a group of five or six other heavy- hitting art dealers in front of a Henry Darger painting in the booth of Carl Hammer. I couldn’t hear what they were saying, but I could tell that something heavy was going down. She was quite small and slight; in her sixties, wearing blue jeans and a punk rock, sleeveless black t-shirt, and holding her own in whatever they were talking about. I was struck that she had very thin and wrinkly arms, and I respected that she was strong enough and had the self- respect to put them out there. She was the epitome of cool. She had grace and presence. She reacted immediately to the work, but became more interested when she heard Billie’s story and circumstances. The opening was drawing near so there was no more time to talk but she asked if I could come by her gallery the next day after the show. How great, I thought. Of course I will. I haven’t had that many, but I have great fondness for those moments in my life where I say to myself, “how cool is this” “Here I am going into Phyllis Kind’s Soho gallery in New York city to show her pictures of Billy Orr’s zodiac sculptures.” I wish Billy were here. Can you imagine? I flashed on Billy in his kitchen telling the mother raccoon who had walked through the front door that “she would have to wait for dinner as he had company”, and I imagined Billy standing next to me in the gallery talking to Kind, and I just tried to make note of everything around me, and everything that was said, and going on. Now twenty-two years on I remember some of it. Phyllis was interested in the fact that Billy had created his own “wooden” version of Stonehenge in his back forty, and that he occupied it with many Irish leprechauns, and zodiac figures he had created in cement. She imagined having all the work in her gallery, in a type of recreation of Billie’s world. We excitedly talked on about it a bit more, and we agreed that I would look into it when I got home in terms of interest on Billie’s part, and the logistics of getting all that cement to New York. I could tell that her interest was sincere, but I could also see a lot of reasons why it would probably just remain a lovely thought. Billy, predictably wasn’t the least bit interested, and of course the cost of getting all those heavy and fragile pieces to New York was prohibitive. The end. Still. It is something to behold. Something that will live on in my head. Billy Orr shuffling up and muttering “hello” to Phyllis Kind at the opening of his solo exhibition in New York. 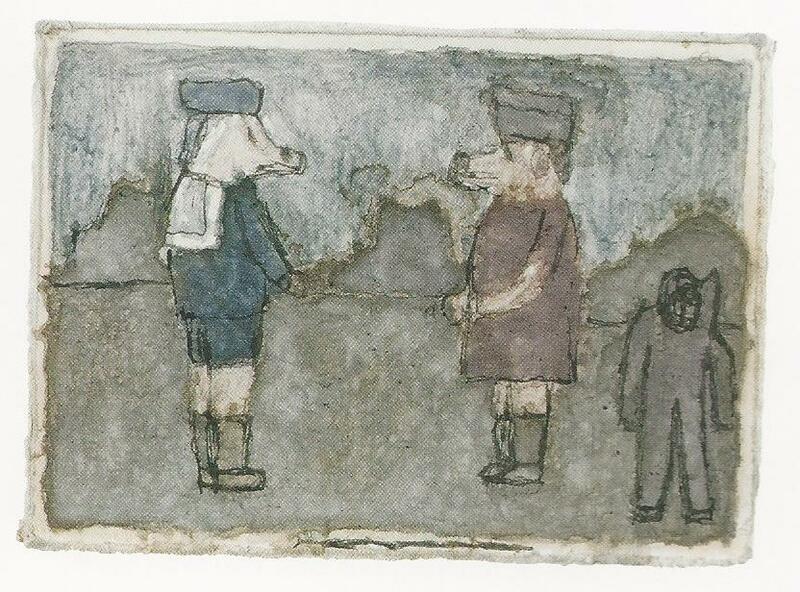 As explained by the McMichael Gallery’s Chief Curator, Jean Blodgett in the forward to the catalogue accompanying the 1991 solo exhibition of the works of Gilbert Desrochers, entitled “The Peaceable Kingdom of Gilbert Desrochers” plans for a folk art exhibition had been underway for several years. He states “folk art seemed eminently suitable for display at the gallery, and an appropriate subject for an institution dedicated to Canadian art.” He explains that they asked artist John Hartman to guest curate based on his interest and knowledge of folk art. At first it was planned to be a group exhibit, which was then narrowed down to a few artists, and finally it was decided to focus on the work of one artist, Gilbert Desrocher, whom Hartman had come to know when he was attracted by a sculpture displayed on a fence post he spotted while driving down a back road in Tiny Township on the southern end of Georgian Bay in Ontario. He stopped, and made his acquaintance, and quickly this developed into a strong friendship. In September of 1990 John took Mr. Blodgett to Gilbert’s house to discuss the dates and arrangements for the exhibit to be held the following year. It was devastating then when they learned a week later that Mr. Desrochers had died suddenly. Gilbert Desrochers was born on May 2, 1926, in Tiny Township. The fifth child in a family of six boys and one girl. His father Thomas owned a farm on the eighteenth concession, overlooking the bluffs of Thunder Bay Beach. He only attended school for two years when his mother died, and he went to work with his father and brothers on the family farm. “I wasn’t much good in school” he recalled. “I didn’t learn much. I went to school only to smoke. And I slept. I was always so tired that I fell asleep. I had no notion about school. I had only work in my head. I figured that work was easier than school.” Our father couldn’t read or write either and said “it’s just as well that you are like me. Come work with me in the woods.” “My father had two hundred sheep, and we took care of them. Also nine cows, three horses, chickens and pigs. In the winter we would cut wood all the time. We didn’t have a power saw so me and Joseph would cut wood all winter. It was a lot of work with cross-cut saws and Swede saws. In 1941 at fifteen, he and his twelve year old brother Gabe took the money form three cords of wood that they had sold and began walking to the home of their sister Aurore who lived in Toronto. They caught a ride with a group of soldiers and got dropped off near their destination. Gabe stayed to attend school but Gilbert returned home to cut wood with his father which is what he continued to do until he was twenty five. Not satisfied with his life he began to wander, returning home only when his money ran out. He would leave and return unannounced, and often no one in the family knew his whereabouts. In 1952 Gilbert was incarcerated at the federal penitentiary in Kingston for stealing a barge. There he worked for a while in the carpentry shop, until he overheard other prisoners saying that they would “get him”. He refused to return to the shop and eventually became uncontrollable and was put into solitary confinement. He had a nervous breakdown and, according to his brother Gabe he was given shock therapy. His stay in Kingston was two years. While there that he had his first religious experience, when God appeared to him on the walls. The day his parole was up he headed north to work in the lumber camps near Kapuskasing. In 1953 Gilbert’s father died and he became close to his brother Gabe. For the next twenty years he continued to work seasonally in the tobacco fields of southern Ontario, and the bush camps in the North. Occasionally returning to live with Gabe and his wife Lucienne, and to work with Gabe as a roofer. In 1975 he was working in Toronto and while looking in the garbage in an alley something struck him from behind. When he turned around no one was there. He concluded it must have been God. After his religious experience in Toronto, Gilbert moved to his brother’s farm near Perkinsfield, where he lived in a small trailer and attended church regularly. It was here that Gilbert started to carve. He continued to have visions and said that he began making sculpture because God came to him in a dream and told him that he had to make something, then gave him visions of things to make. The dream recurred, and after the third time Gilbert started making carvings. During the period that he was active, Gilbert created hand carved depictions of the people, animals and events from Christian bible stories. He would often harden the high gloss paint, used to colour and give the necessary details to his sculptures, by heating his workshop, located in the same trailer that he slept, to 120 degrees F. All of his work was created for installation in and around his living space, or on his tractor. 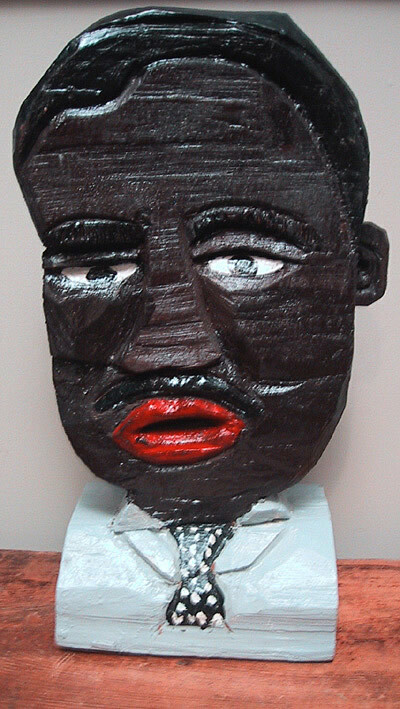 Outsider art is like Rap music in that you’ve got to have “street cred”. 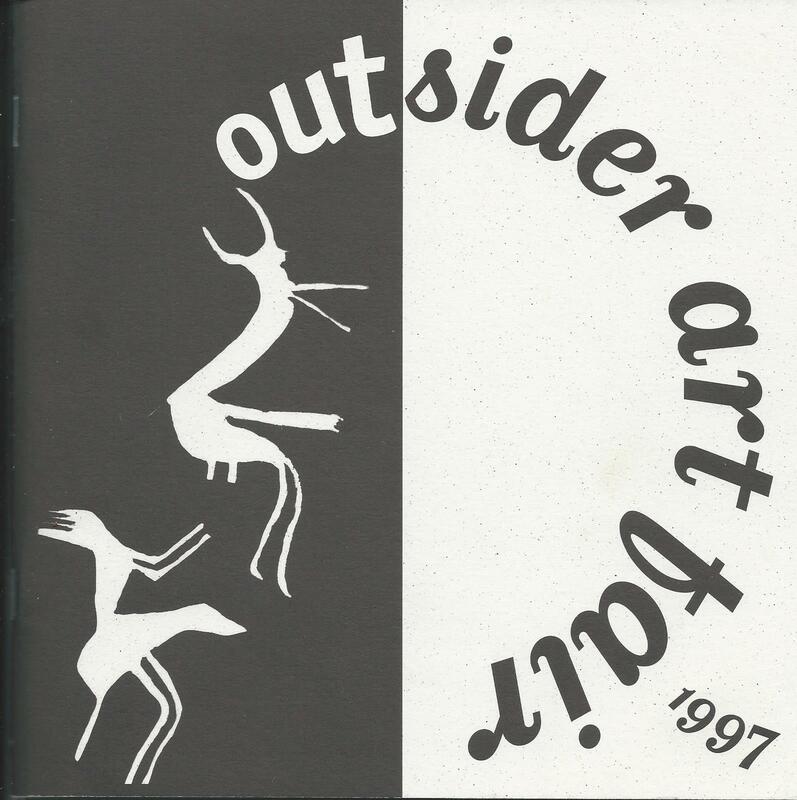 If you’re just a weird guy who doesn’t like people much, lives at the edge of town, and you paint, you aren’t necessarily an outsider artist. It is about the lifestyle you live, and the visions you present. The line between folk art and outsider art is a blurry one, but basically outsider art is a term applied to art made by someone untrained, who lives outside society. Sometimes outsider artists are institutionalized; some outsider artists live on the streets. Philip Melvin is such an artist. I met him once in Toronto. I was taking the streetcar down Queen street when I noticed someone had set up a bunch of crazy looking paintings along the curb in front of a CIBC bank on a busy corner. They looked interesting so I jumped off at the next stop and went back to see them. They were mostly portraits of well know people and although they really didn’t look at all like the actual people, they all had energy and humour, and I quite liked them. I did not know of him at the time, but it was Philip Melvin. Looking pretty disheveled with an impressive beard, and quick eyes. I asked him if these were his paintings, and if they were for sale and he said “yes, and you can have any one of them for $60”. So I bought one. He introduced himself and we had a really odd but quite interesting chat, and shortly the next street car came along, and I had to say a quick good-bye and jump on. Appointments to keep. That was it. I could see that trying to get a contact number would be pointless. Philip Melvin was born in 1938. He lived all across Canada, but his last known residence was in Vancouver, British Columbia. Not much has been recorded about him. He was born in Lamanche, Newfoundland. From there he travelled to Toronto Ontario, and once described himself as ‘the biggest fool that ever hit Toronto’ and as ‘the man from Lamanche’. Finding himself in continual trouble with the law and at the periphery of society, he spent a good deal of time in correctional facilities or rehabilitation centres. In 1980 he began carving religious plaques and subjects, as well as painting Toronto landmarks and familiar sights. Spending time at the Lakehead, or in Toronto, often at St. Michael’s Cathedral, Philip Melvin would sometimes turn to carving in hope of selling a few pieces as a means of minimal survival. Philip Melvin moved to Vancouver where he continued to get into trouble with authorities. He made the news when he was found wandering around Stanley Park with a power saw. He was just looking for deadfall for his sculpture but the authorities thought otherwise. His work was included in the 2000 Canadian Museum of Civilization exhibition “Under the Sign of the Cross: Creative Christianity in Canada”. As far as I know he is still alive but I haven’t heard anything about him for a couple of years. Coming back into the Puck building on the cold afternoon of January 23rd I started to feel that wonderful buzz that one feels before the opening of a big marketing event. A combination of excitement, and expectation, mixed with a touch of anxiety realizing that in a couple of hours the throngs would be pouring in, and we would be off and running, either making it, or breaking it. The booth was set up and looked good, so I had a couple of hours to check out the show. The first thing I did was cross the aisle to have a closer look at some work which I had been noticing which was deceptively simple in it’s construction but very compelling. 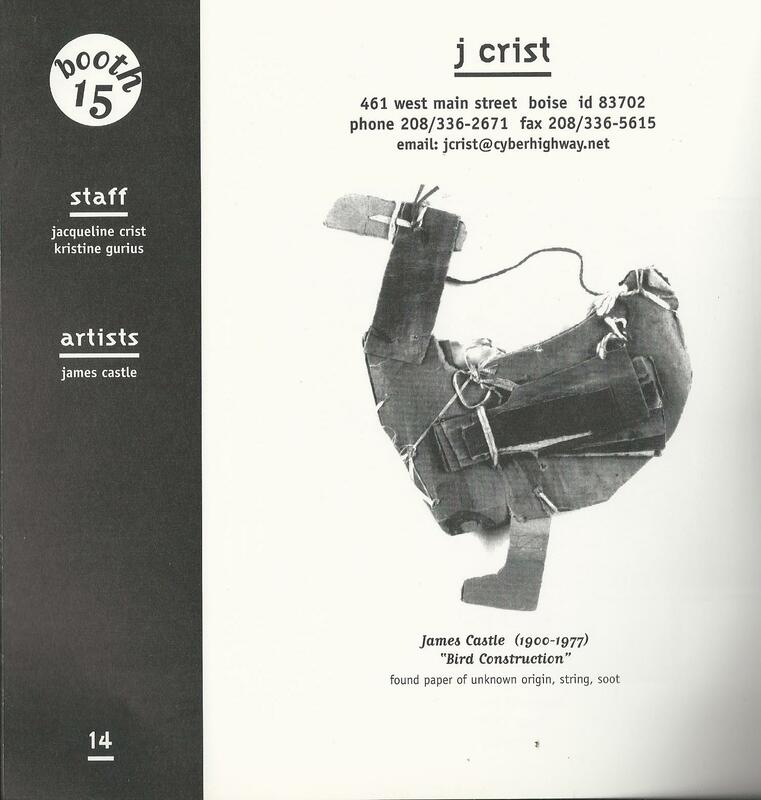 The entire booth of J Crist from Boise, Idaho was filled with the yet unknown work of James Castle (1900- 1977). Jacqueline Crist who runs the gallery acts as agent for the artist’s estate and her gallery houses a considerable body of this particularly driven and prolific artist’s work. On this occasion she put “all of her eggs in one basket” and just brought works by Castle. Getting up close to the work, I became more and more enamored. Put together with spit, and soot and cardboard etc, the quantity and variety of his output is astonishing. I came to find out that he devoted himself virtually full time to his art for nearly seven decades. 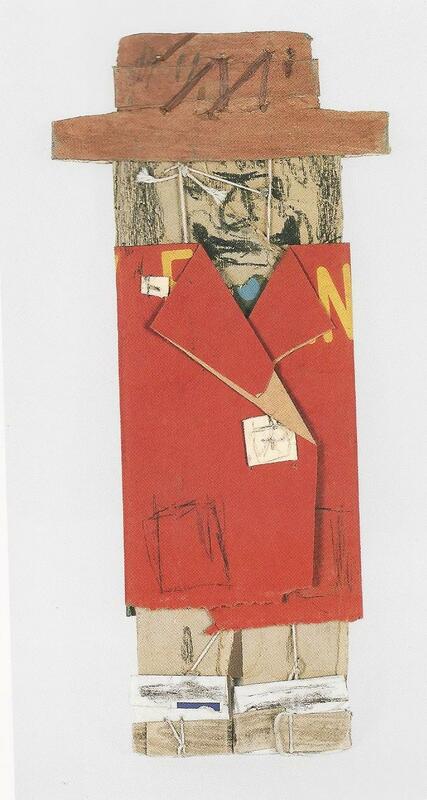 His drawings, assemblages, and handmade books are compellingly mysterious, and contain a confounding sophistication. Perhaps this quality is the essence of what attracts me to “outsider art”. In the case of James Castle I was an immediate fan. The tagged prices seemed fair. Asking in the upper hundreds on up for the, in most cases, diminutive drawings and constructions. Hmmm. I began to think that I may score one of these beautiful little pieces to take home but of course I had to check out the rest of the show first, just in case there was another Bill Traylor drawing for low money. Still feeling tough that I had missed out the year before. I noticed the Traylor drawing I had missed out on was present and priced up by a few more thousand dollars. Way to go, Phil. Then I noticed that Carl Hammer’s booth was this year graced by two large, magnificent scrolls by Henry Darger. This was the year to promote Darger, as there was running simultaneously with the show, a Museum of American Folk Art exhibition of more than 60 of his paintings called “the Unreality of Being”. I was interested to note but not surprised that the prices of his work had gone up considerably. So I made my way from booth to booth growing more determined by the second that a small James Castle drawing was in my future. I wasn’t going to miss out like last year by hesitating and calling home for a conference. No, I was going to head right back and make my selection. But what’s this? As I approach I see a group of the top dogs including Carl hammer leaving the booth. My heart began to sink a little, but I told myself to relax, it’s o.k. So the selection process may be a little bit easier. I hadn’t set my sites on any work in particular. I slid up to Jacqueline whom I had become quite friendly with during set up and asked her “what’s up”. “It’s the craziest thing. Those big wigs just came over, and bought my entire booth. Lock, stock and barrel. I’m finished here before it opens. I guess I could just pack up and go home, but I want to stay because I was so looking forward to being a part of the show.” Nice problem to have. Well there you go. Are you beginning to sense a theme here when it comes to me buying, or should I say not buying at art shows? Well in this case she had plenty more work at home so I could have theoretically ended up with something else, but I chose to just let it pass, get on with the show, and concentrate on just doing my best to sell, sell, sell, for my friend Joy. The show went even better than the year before, and we were all very happy with the experience. Well, except for the missing out on the James Castle thing, but there you go. 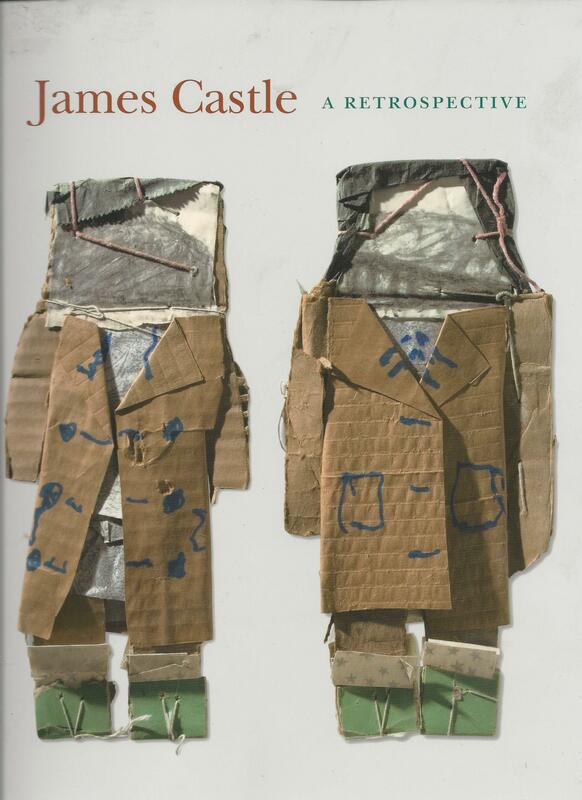 Since then a splendid book on Castle has come out in 2009, coinciding with the exhibition at the Philadelphia Museum of Art entitled “James Castle, a Retrospective”. I highly recommend it. I’ve got a copy. I love looking through it. It sits in place for the one that got away. June 1994. Stephen Outhouse (middle with cap), Mark Robichaud (right), and David Stephens standing with the purser on the Digby ferry – on our way to Paris! We had this shark – a carving by Stephen – mounted to the top of the the truck cab. I received this photo and note from Nova Scotia artist David Stephens shortly after last weeks post was published. Thanks David for permitting me to post it here. It’s a long drive from Nova Scotia for a one day show. This illustrates the dedication of all involved to this unique folk art event. In looking over my support material, I came across some interesting definitions of folk art in the initial correspondence from promoter Michael Hennigan. I include them here to add to the dialogue which we as collectors and enthusiasts continue to have on what constitutes folk art; and what of this art is worthy of study and preservation. With the inclusion of contemporary folk art at such distinguished shows as Cabin Fever, coming up February 6 and 7, 2016 in Kingston, Ontario, and the Bowmanville show which every year is on Good Friday, we have an opportunity to compare the work presented there to these definitions. I think that you will find that for the most part these shows rise to these standards. I wish I could say the same for the field shows, but perhaps they will be inspired to improve as the knowledge of what constitutes folk art is understood by more and more people. Here’s hoping. I went through my photos and found a picture of one of the dinosaurs we brought to the show. Imagine being greeted by two of these 9′ monsters.